Election Day Pork – the first part – Guest Post – TONY CANNON! It seemed appropriate on a day when the elections are held to cook the meat that closely represents the political process to me, yes I mean pork! Biz had gone out and bought a 2.8 pound pork roast and said aw, just throw it in Tony!” But with blog eyes watching, I felt the pressure. I said “help me Bobby Flay!” and sadly, came up with a southwestern pork pudding! Then it hit me like a bolt of lightening. Garlic! My one true friend is garlic. I looked on-line and found a garlic rub, but I said “No, this is not what Obi would do!” I took the basic ingredients but then added several of my own. Being Italian (my french was removed during messy colonoscopy) I added olive oil and being a lush, I added Jim Beam whiskey. 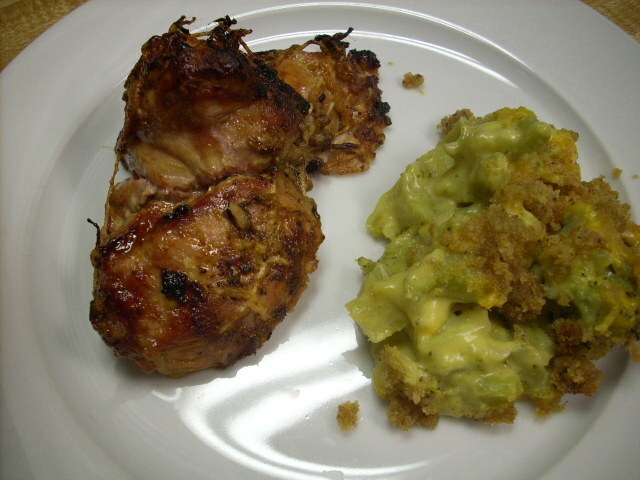 Normally, on this blog, we produce pictures showing the stages of development of this dish. Sadly, my wife Biz forgot to take the picture of one tree in McHenry County she missed, so i did not have a camera with me. I can however, describe most of what I did. I then threw the entire mixture into the blender and let that mutha purr. 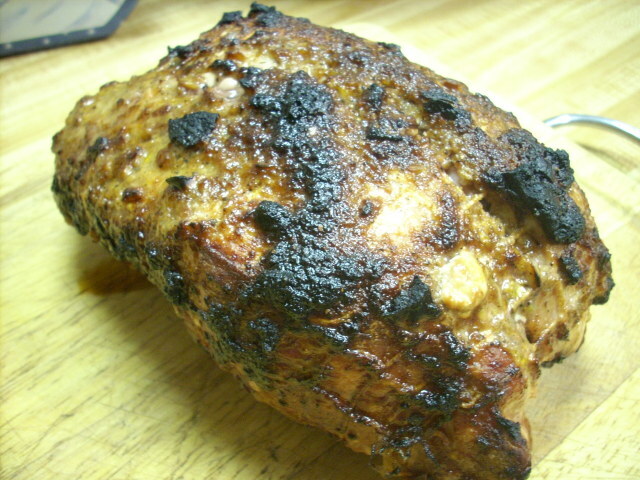 I spread the heavenly mixture over the roast, it was thick and aromatic. I fired up the Ole Weber grill. I used the natural chunk charcoal. It comes unbriquetted, and makes me feel like a rugged mountain dweller. 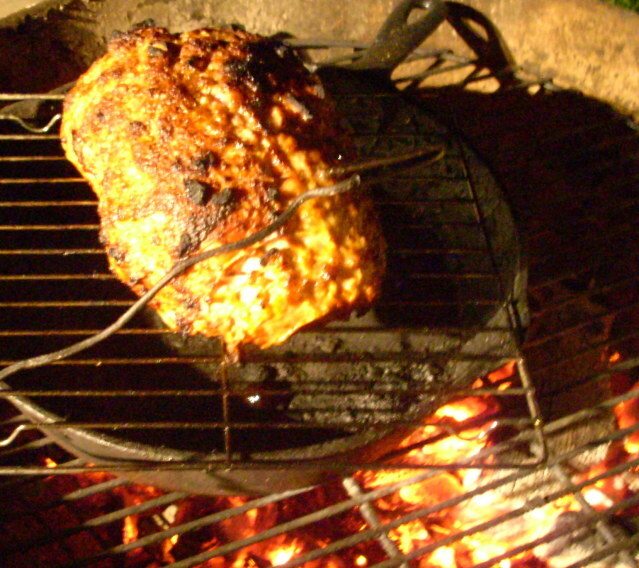 I put the roast on a rack with a pan beneath it. I put a temperature probe into the middle, and will remove it when it hits 160 degrees. I will cover it in an aluminum tent for 10 minutes or so. I think I did something special today. I hope you all agree and award me some sort of important blogger award, perhaps an uproar from the blogging community will make that happen. I am now going to get that pork and we will eat it. I think this pig died happy! Biz will report on our findings after the meal. Bless you all! Thank you to my blog husband, Tony Cannon, for his lovely words! Now on to the pics! the remndants of the delicious rub! not enough light, but look at those coals! gotta love that in November! hot off the grill, ready to rest! My portion was 5 ounces of pork with 3/5 cup broccoli mixture. Yummo! 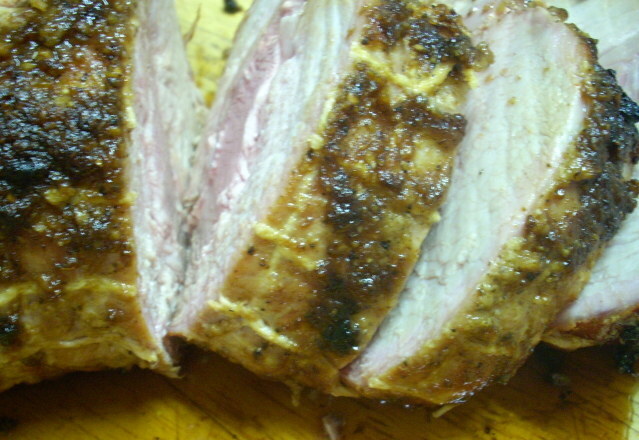 Thanks to Tony for his guest blogging tonight and the delicious pork! I love you! Please feel free to give him a shout out! 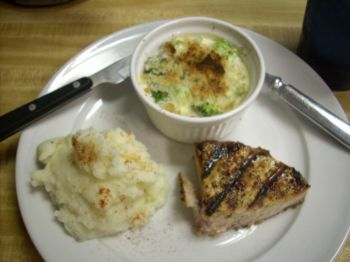 On the menu: Pork chops, garlic mashed potatoes, broccoli au gratin. 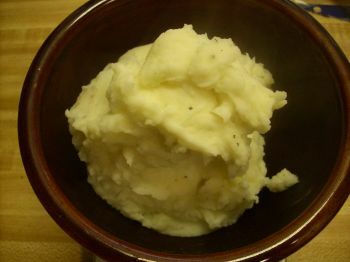 Melt butter completely, add flour and stir to combine. 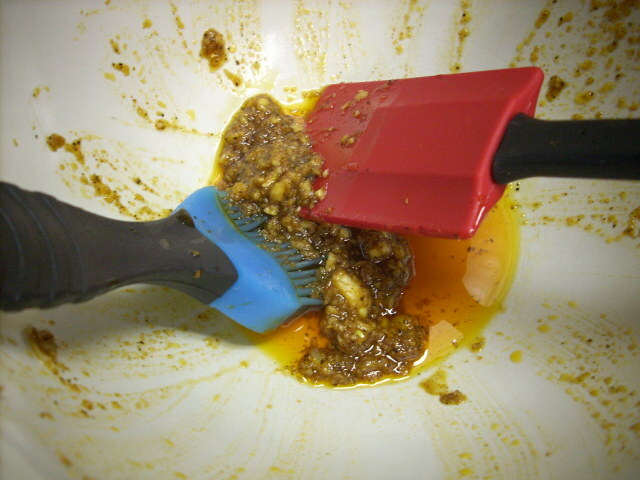 Slowly add half and half until sauce thickens, add cheese and stir until melts. 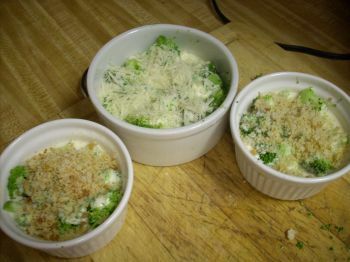 In three separate ramakins, add cooked chopped broccoli. This sauce made 9 ounces, so I divided 3 ounces of sauce to each ramiken. I crushed 6 croutons and sprinkled over two ramikens, and added parmesan cheese to the third. Broil under low heat until nice and bubbly. 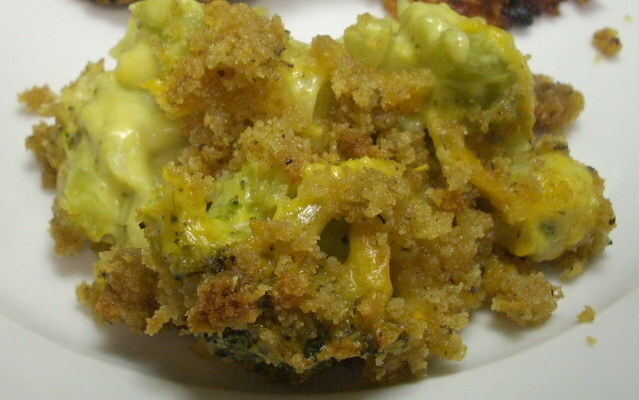 Note: These were good, but very mild and creamy – I think next time I’d use extra sharp cheddar cheese. These pork chops were huge! I cut off a 3 oz. portion for me. Late starts on Mondays for my daughters school means no workout. I was going to work out at lunch, but realized I forgot to bring my clothes home from last night, and when I opened my bag, I offended myself! That meant an after dinner workout.